There’s such a flurry of spring phenomena that it can be tricky picking a focus. But bird behavior is as good a place to start as anywhere. Morning visitors to the Minneapolis Sculpture Garden will witness the heavy air traffic of Common Grackles frequenting the muddy low waters near Spoonbridge and Cherry. Watch the video below and tell me that soggy clump of plant matter doesn’t look perfect for building a nest! The grande allée’s arbor vitae and linden trees are abuzz with grackles calling and strutting. 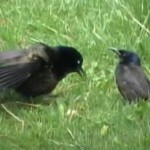 And if you’re lucky, you might witness a pair of Common Grackles performing a courtship dance! In conjunction with Open Field, I’ll be posting a series of reports that examine Open Field and the Minneapolis Sculpture Garden through the lens of phenology. The lens of what now? Phenology refers to recurring life cycle stages, such as leafing and flowering, emergence of insects, and migration of birds. As an amateur naturalist and the Open Field Phenologist-in-Residence, it’s my privilege to observe, document, and share the sequence of natural events as it unfolds on the Walker campus. If you’re interested in more local phenological phenomena, visit openphenology.blogspot.com. Or to learn more about the science of phenology, check out the National Phenology Network and the Minnesota Phenology Network.